This film has been imagined before, in 1997 with a TV movie called Elvis Meets Nixon, starring Warden Norton himself, Bob Gunton, as President Nixon. This time, we get Kevin Spacey, who has been making a living recently as the crooked politician Frank Underwood, so no real stretch there. We also get Michael Shannon as Elvis, which may be one of the more daring casting decisions of the last few years. Shannon is one of the darkest actors in Hollywood, and to ask him to play a man who is still known as perhaps the greatest entertainer in human history, well that takes some imagination. Luckily, Shannon is a genius, Elvis did go though dark periods, Spacey is perfection, and much of this story is real, unbelievably so, the result being a film that watches much better than it reads. In December of 1970, Elvis Presley took a trip to Washington D.C. Concerned with the growing American drug problem, the wildness of the hippies, and the deterioration of morals among the youth of our nation, he decided that he had better use his power for good, make some change in the country before it was too late. Elvis was already a military veteran, an avid gun enthusiast, a member of local law enforcement agencies, but wanted something bigger & more impactful. So he requested an audience with President Nixon with the idea of becoming a Federal Agent At-Large, a sort of undercover superhero who could bring about change from the inside. The result was a highly unusual meeting, a historic encounter, and one of the most famous photographs in America history. Don’t doubt Spacey & Shannon, no matter how ludicrous the concept sounds in theory. First off, they have the talent to pull off anything. Spacey was perfect as Nixon, Shannon equally so as Elvis, and the film brought to life sides of both men that we rarely see; the humor of Nixon, the sadness of Elvis. Shannon shows the King as he turns inward, becomes stranger, begins not to trust anyone other than the boys he’s known all his life. It’s a great moment to reenact, all the more engaging because it’s actually true; Elvis traveled there, made these odd requests, pulled a gun out at a donut shop, railed against the Beatles. The film itself is very funny, but quietly so, picking up pace after a slow beginning to become something truly enjoyable and a great time capsule as well. In a small side role, Colin Hanks did perhaps his best work, sounding exactly like his father, Evan Peters shone as well, though what any casting director saw in Alex Pettyfer I’ll never know. 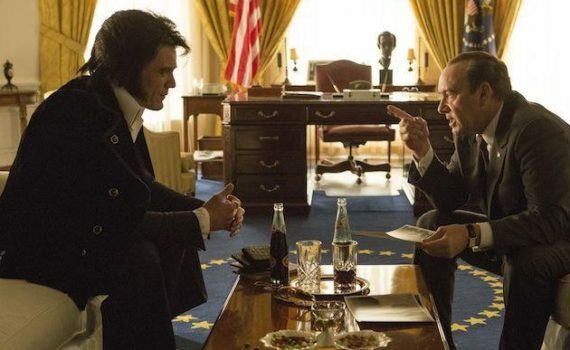 Better than the word on the street and worth your time, Elvis & Nixon is a movie that will surprise & delight, a captivating 80 minutes like you’ll very rarely see.